Another way to find out good places to eat is ask the locals. In our case, the local made a suggestion to us without our solicitation. My mother and I were actually getting our laundry done at the nearby laundromat. I love it. We drop our dirty clothes off and they wash, dry and fold our clothes for us! Within walking distances of our hotel, we walked by at least three different laundromats. The price is very reasonable and it’s great when travelling to Hong Kong for long periods of time. You don’t need to pack so much clothes. Where was I…yes back to food recommendation. The laundromat lady overheard us talking about a place we would like to eat congee. 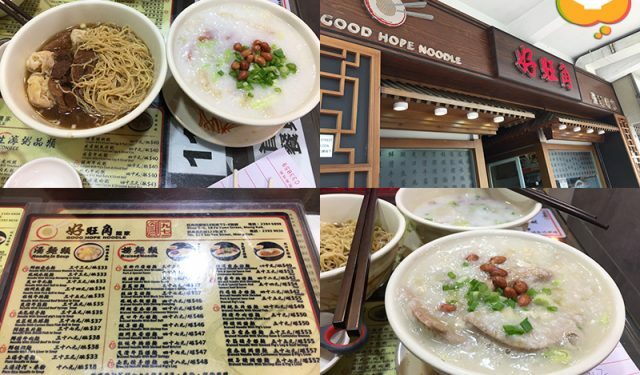 She thought the place we wanted to go wasn’t that great so she gave us her suggestion—Good Hope Noodle (好旺角粥麵專家). We thought why not give this place a try since we’d be here for awhile anyway. In this case, we didn’t think her recommendation was good for our taste. The congee was so so and it was pricey for the mediocre food. Nonetheless, it was “fresh boiled congee” (生滾粥) which means they cook all the ingredients as you order them. Plus I love Chinese breakfast foods so it was ok. We also ordered the wonton and beef brisket soup noodles too. The noodles were great but both the noodles and congee portion were small even in Hong Kong standard. 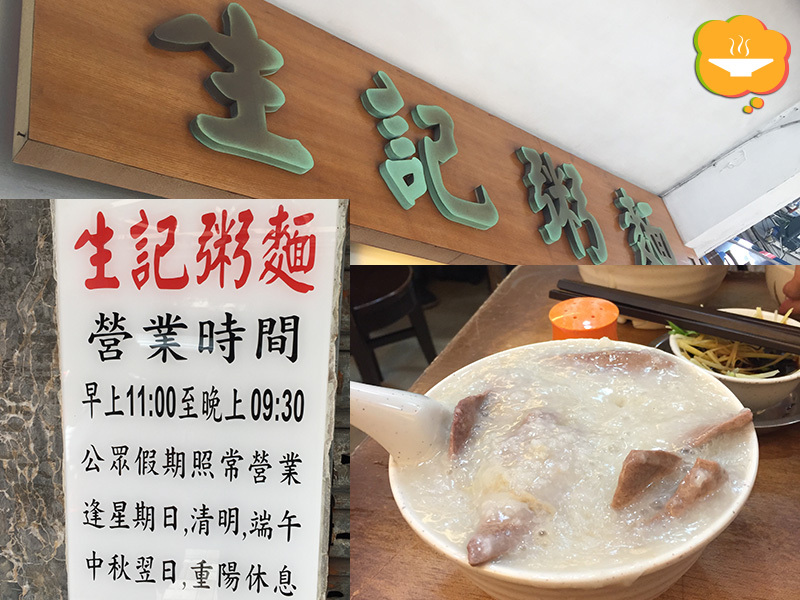 When you get to Hong Kong make sure you find a “fresh boiled congee” place to eat. If you like congee, you won’t be disappointed! One of the best things when travelling with people who know the place is their recommendation on where to eat. Since my mom goes to Hong Kong every year, she has either tried or heard of somewhere good to eat. She doesn’t use computers or any fancy restaurant apps. She just knows from being there and talking to her friends to find out where to go. I, on the other hand, rely on technology to find places to eat. I actually discovered the Openrice website and app while searching for restaurants in Hong Kong. This app might be better than Yelp because it’s what locals use to search for restaurant recommendations. It’s actually great because it’s in both English and Chinese. So you can match up the Chinese characters from your app to the restaurant if the sign is in Chinese only and you don’t read Chinese 🙂 . 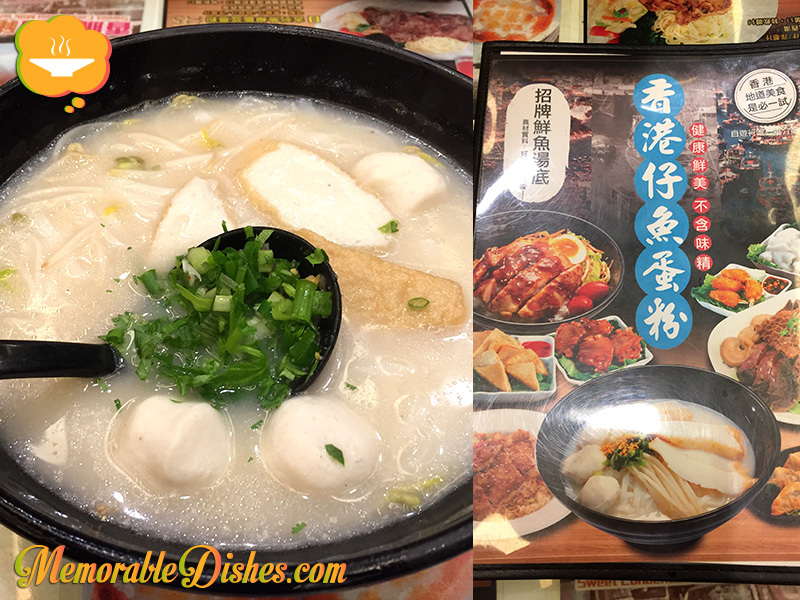 Aberdeen Fishball & Noodles Restaurant (香港仔魚蛋粉) is one of the places that we stumbled upon when travelling around in Mong Kok. There are many locations around and it seems like some locations are better than others. The reason we went in was because my mom knows that it’s one of the popular chain places. 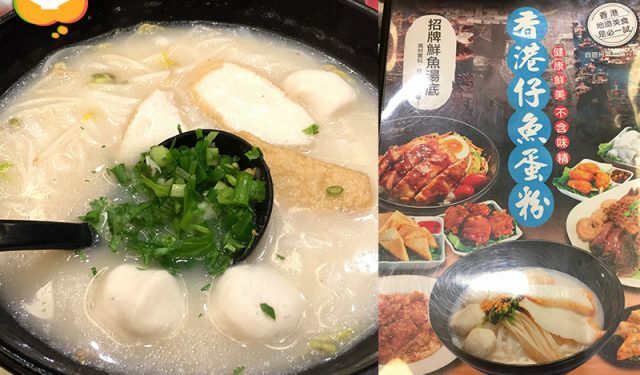 This place is famous for their fish ball soup noodles. Fish Ball Noodles – Don’t remember being spectacular but the fish broth was pretty tasty. The broth is made with water chestnuts and dry bean curd sticks hence the milky white broth. The homemade chili oil goes great with this dish. 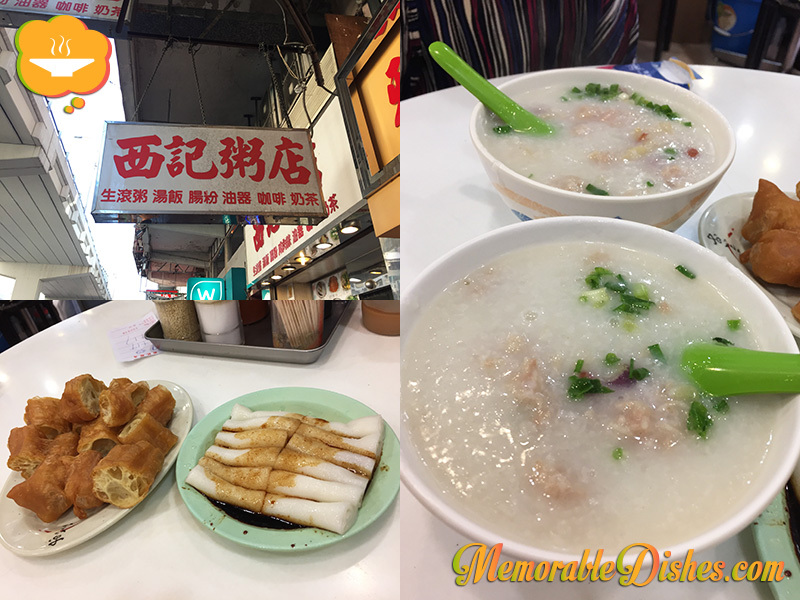 Sei Kee Congee (西記粥店) is one of the places we go back to every time we visit Hong Kong. There seems to be three locations but we always go to the one on Prince Edward Road. It’s a hole in the wall and the first place my dad took us to when my husband went to Hong Kong the very first time. This place is famous for their “fresh boiled” congee (生滾粥) which means they cook all the ingredients as you order them. 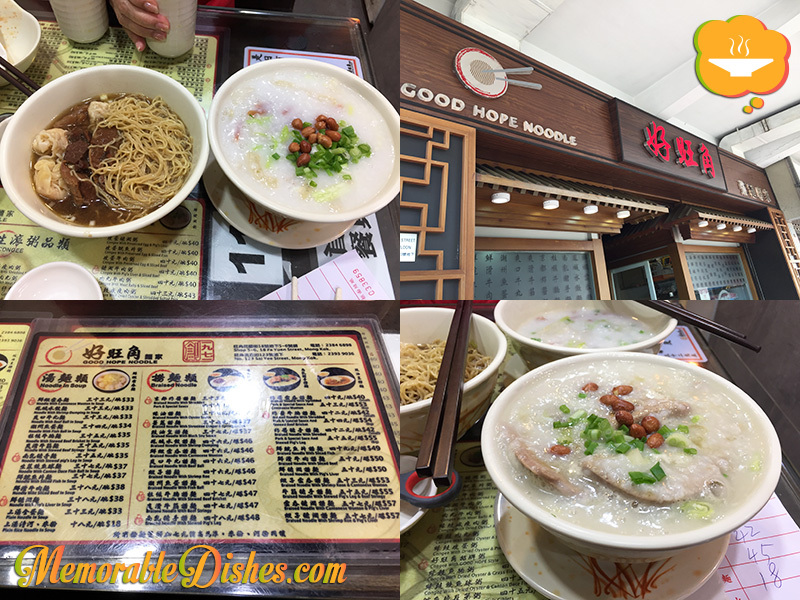 My husband has fond memories of this place especially the minced beef congee—his all-time favourite Memorable Dish. My favourite congee to order in Hong Kong is the Boat Congee (艇仔粥). It has a mix of different ingredients but mostly seafood, hence the name “boat”. This congee is quintessentially Hong Kong and every restaurant makes it slightly different. Minced Beef and Boat Congee – Just like how I remember them. Standard taste like all other congee places I had but very hot and fresh. Youtiao (Chinese fried cruller) and Cheung Fun (rice noodle roll) – I don’t remember seeing them making these in-house. They taste ok, nothing spectacular. When travelling to the same place more than once, we tend to go back to the same restaurants over and over again. The food might not be the best but we tend to go back anyways. I think it’s because it brings back nostalgic travel memories for us. Sometimes it’s not about the food, but it’s about the company. I can’t say I’ve had bad meals in Hong Kong. Some places might be mediocre but they are never “bad”. I think it’s because Hong Kong eaters have such a discernible taste that you cannot possibly serve bad food and stay afloat. When I decided to go on a girls trip with my mother and my toddler girl, I researched on Yelp and online for restaurants and food places to check out. I don’t know if I ended up hitting any of the places on my list! Once I was there, we were eating on the go. Food is literally everywhere—big restaurants, little restaurants, fast food, fast but good food. If you’ve been to Hong Kong, you know what I mean. One can never go hungry. We ended up eating at places we visited and nearby areas. My mother also knew of some places to check out from her previous trips (she pretty much goes once a year). Plus my older brother who works between mainland China and Hong Kong took us to different places to eat. Even people we met gave us recommendations on where to go. I have to say all Hong Kong people are food lovers! When we think of chain restaurants in North America, we picture cookie cutter places that serve consistent but mediocre food. However in Hong Kong, chain restaurants could sometimes be better than the one off restaurants. They have standards to adhere to and the staff are usually friendlier than other local restaurants. Having said that, we did check out a restaurant that was famous for their roast goose but we were rather disappointed. We had our first meal in Hong Kong at Tao Heung (稻香) near our hotel. We literally stepped outside of the hotel, looked around and saw their huge sign at a nearby local mall and headed towards it. Since we know it’s a chain restaurant, we were sure it would be decent. We were super hungry so we ate half of the food before I even took the photo. 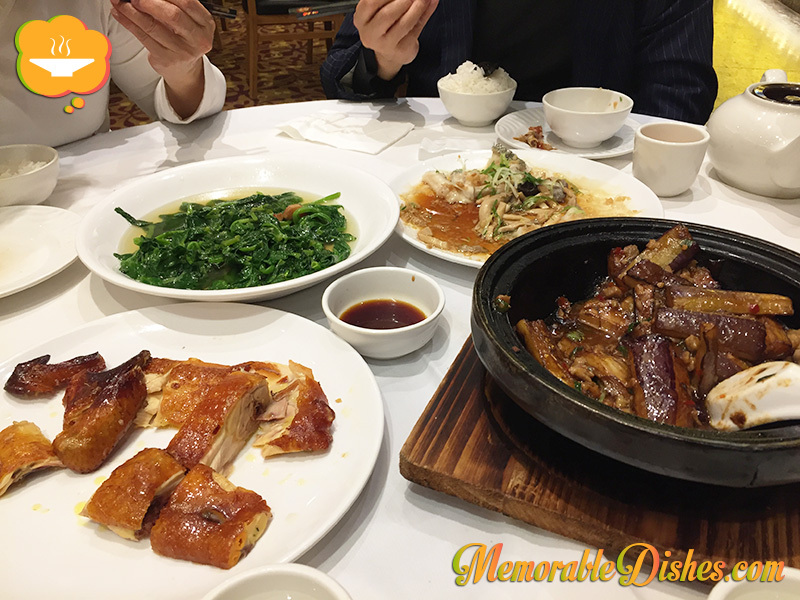 Crispy Chicken – Standard at Cantonese restaurants. I find North American chickens to be blander. But in Asia, they are so much tastier. Sautéed Pea Shoots in Broth – Fresh, tender and delicious. Even my 2-year old child could distinguish the taste of fresh vegetables versus not so fresh ones. She was gravitating towards them and couldn’t stop eating these yummy veggies. Steamed Garlic Giant Grouper (龍躉) Slices – My mom said that you cannot eat it whole because it’s too big to steam on its own. Restaurants usually sell them in pieces instead of whole. They sliced them and steamed them like they would with whole fishes. Fish Fragrant Eggplant (鱼香茄子) – This dish is a misnomer because there’s no fish in it at all. It is a seasoning mixture in Chinese Sichuan cuisine, and also refers to the resulting sauce in which meat or vegetables are cooked. (https://en.wikipedia.org/wiki/Yuxiang) It was very tasty with a hint of spice. Cantonese adopted this dish and made it not as spicy. 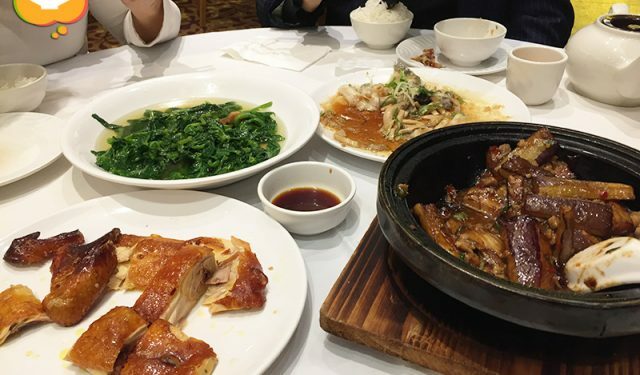 Below are the photos of the infamous roast goose restaurant. Tourists can actually buy it freshly roasted and the restaurant has a system of packaging it so that you can fly back to your home country with it (providing your flight isn’t that long and your country allows you to bring back meat items.) My brother took us there because we happened to be in the area so we gave it a try. This infamous roast goose restaurant was not as good as expected, and quite expensive for what it is. The roast goose was drowned with this brown sauce. It’s almost as if they were trying to disguise the lack of crunchiness of the goose skin. However, some might like that style of roast goose. But I prefer the crispy skin. 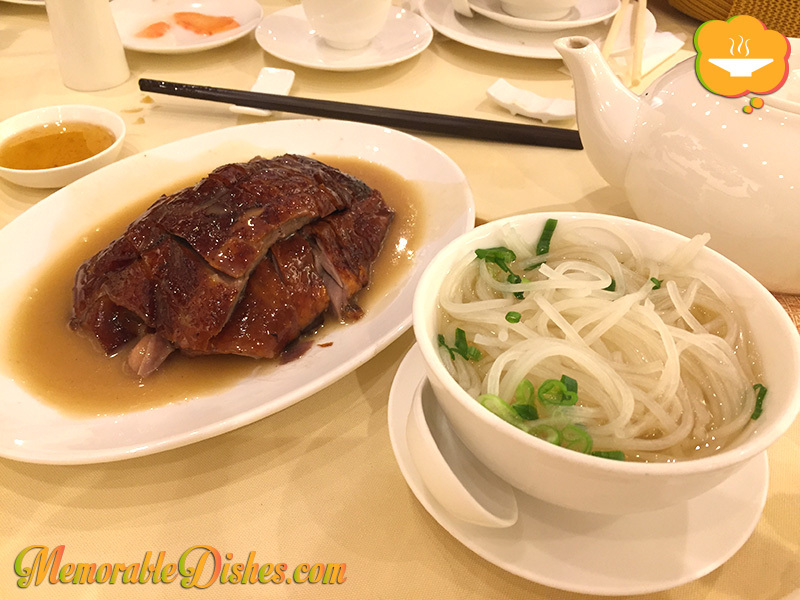 Roast Goose – Drowned with brown sauce. Why would they do that? Lai Fun (瀨粉) in Broth – Usually people eat lai fun with roast goose. The lai fun’s texture was perfect and the broth was pretty tasty. Qilin (麒麟) Tofu – The layers resemble the scales of Qilin (a Chinese mystical, mythical lucky creature). 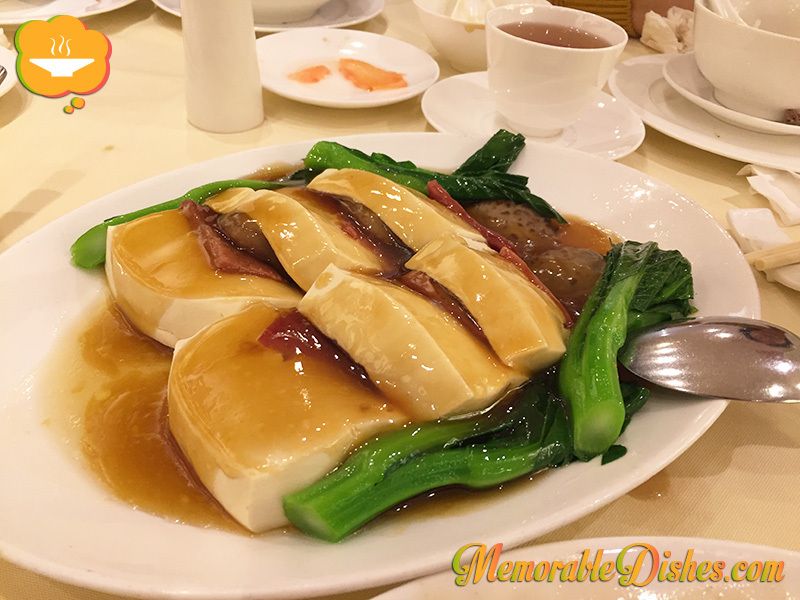 It is made up of tofu, Jinhua ham (金華火腿), and Chinese mushroom. The tofu is very soft and pairs very nicely with the salty ham and mushroom. 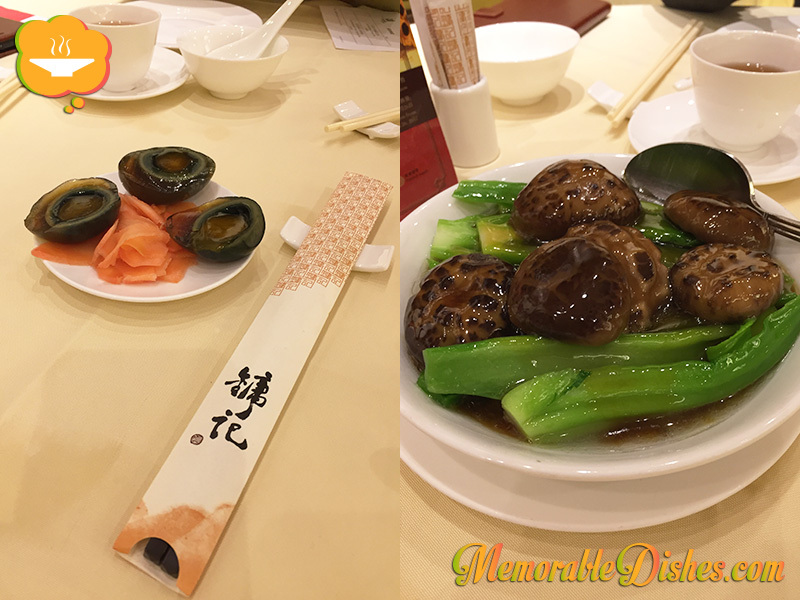 Century Eggs (皮蛋) with Pickled Ginger – I have to admit it was one of the best century eggs I had. Apparently it’s their house specialty (soft yolk)—paired nicely with the pickled ginger. Sautéed Chinese Mustard Greens (芥菜) with Chinese Mushrooms – Tender and tasty cooked in oyster sauce. There are more yummy Memorable Dishes to come as I travel through Hong Kong with my mother and daughter. Every time I come back to visit, there is always something new to discover! I have never been a fan of ratatouille. Maybe I’ve only had bad ratatouille. Until my George Brown College cooking class when my teacher opened my eyes to what good ratatouille could taste like, I avoided it like the plague. Before then, my encounter with ratatouille had not been a favourable one. I might have had mushy ratatouille as a side dish at restaurants but I don’t quite recall how I have come to block this dish from my culinary memory. 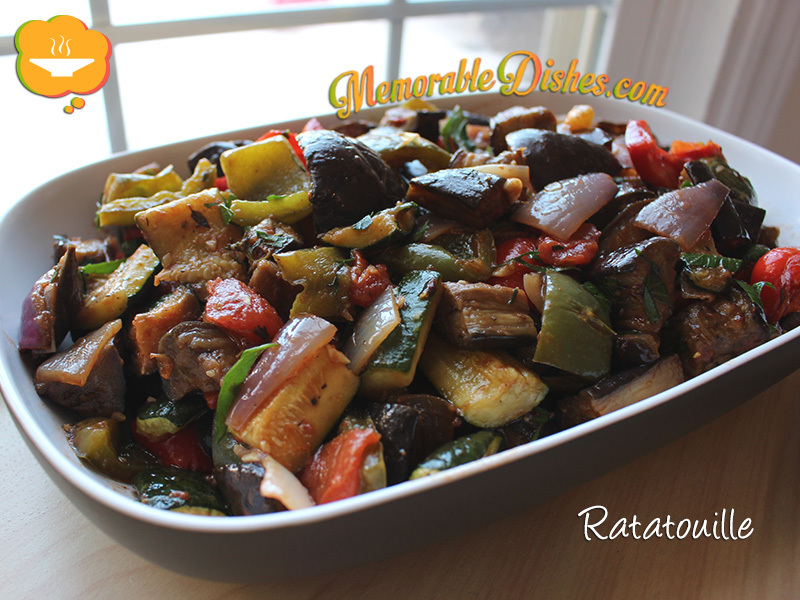 Coincidentally, while I was prepping to write this blog post, I came across a ratatouille recipe from Anthony Bourdain’s cookbook and he shared my own sentiments about ratatouille. He mentioned that he couldn’t stand that “ratatouille is traditionally sort of sludgy.” I couldn’t agree more. Because you cook all the vegetables together without taking into consideration of each vegetable’s cooking time, the dish ends up being one big mushy vegetable stew. Bourdain’s recipe requires you to cook each vegetable separately and then mix in the seasonings afterwards. This prevents the vegetables from over cooking. Mushy vegetables stewed together in one big pot was what I knew to be ratatouille until my George Brown culinary teacher introduced me to a new way of cooking it. He separated the vegetables like Bourdain’s recipe but he kicked it up a notch by roasting the vegetables. I couldn’t believe my tastebuds when I had the ratatouille tasting in my class after he prepared it. Wow! Ratatouille has now become my all-time favourite vegetable dish. This Memorable Dish is not difficult to make. It’s just a bit more time consuming because you have to roast each vegetable separately. However, it’s a great dish to make ahead of time even overnight. All you have to do is reheat it in the oven until it’s warmed through. It tastes best at room temperature. 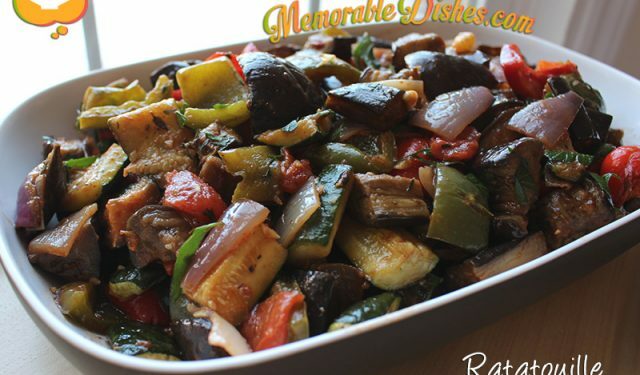 If you have a phobia of ratatouille, please give this dish a try because it will change what your mind and taste buds think of traditional ratatouille. Preheat oven to 450°F and line roasting pan with foil. Cut all vegetables in 3/4 inch cubes. In a bowl, toss each vegetable separately with olive oil and salt & pepper. Roast each type of vegetable separately until they are done. (Red and green peppers together, then eggplant, and then green and yellow zucchinis.) It’ll take approximately 20 minutes for each type of vegetable depending on your oven. Check and toss vegetables around with a spatula if needed. Mix the tomatoes and onions together to roast. When roasting the tomatoes and onions, cook them when they are 3/4 done (approx. 10-15 min.) Then toss in the chopped garlic and thyme sprigs and continue roasting until done. Put all the cooked vegetables into one large bowl and set aside. In a small saucepan, bring chicken/vegetable stock to a simmer and then add tomato paste and bring them to a boil. Pour the tomato paste mixture and basil (if using) and gently mix with the vegetables so they don’t break apart. Note #1: I didn’t have basil on hand when I made this recipe. Instead, I used flat-leaf parsley. Of course the flavour is different but using parsley gives the dish a more refreshing taste. Note #2: To save time, you could roast the vegetables in different pans and put them in the oven at the same time. However, you’ll have to adjust the cooking time because the vegetables on the top rack will take longer to roast. My kids love soup. 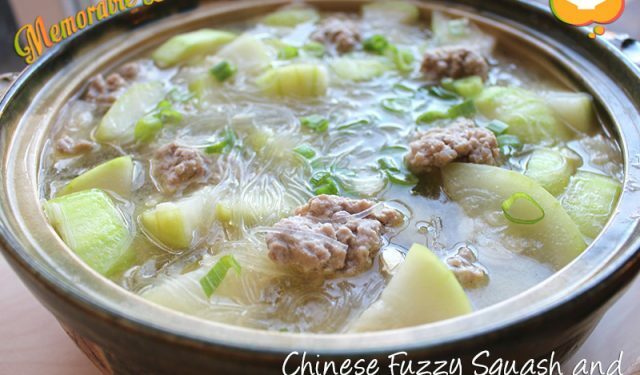 However, growing up in a Chinese family, soup equates to something you drink at the beginning or at the end of a meal but never as a meal itself. Usually, the soup we drink is a broth that cleanses our bodies and helps us stay healthy. My kids were also introduced to drinking cleansing broths at my mother’s house. 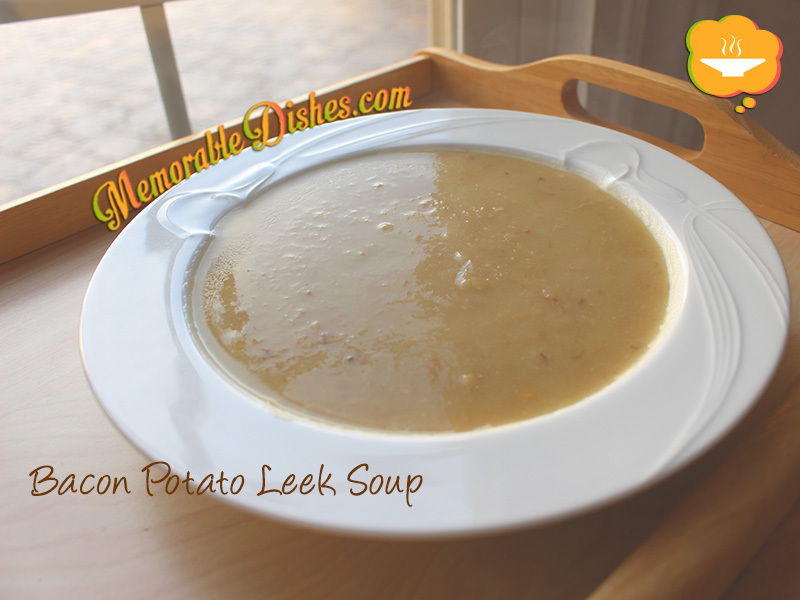 Later on, I learned my mom’s cleansing soup recipes and made them for my kids too. So my kids are growing up drinking cleansing broths like me. 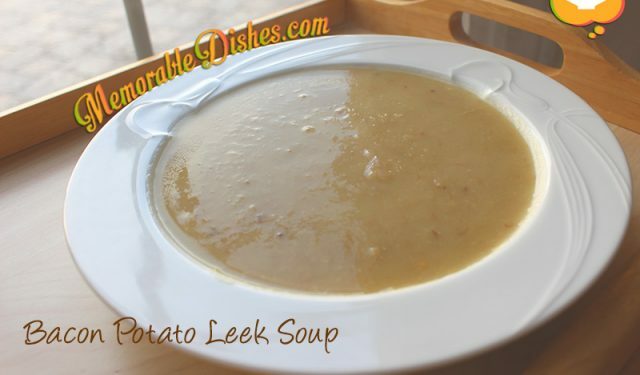 When I initially introduced thicker soups as meals, my boys were flabbergasted. They thought it was weird that the soup was so thick and considered them non-soups. As a mom, I would keep on making foods that my kids originally rejected hoping that they would eventually respond well to them. After making my Roasted Butternut Squash Soup a few times along with bribing them with my Grilled Cheese Sandwiches (Finish the soup first, THEN you can have the grilled cheese! ), they slowly opened themselves up to drinking or eating soup that is less brothy. Strain the bacon and leave 1 tbsp of bacon fat in the pot. Add the leeks to the pot and cook them until softened (approx. 5 min). Add potatoes, bacon, stock and bay leaf. Bring to a boil and cook until potatoes are softened (approx. 15 min). Use an immersion blender to blend until smooth. Bring the puréed soup to a boil. Note #2: If you don’t have smoked bacon, just use a few slices of regular bacon. I don’t claim this to be an authentic Bulgogi recipe because I’m not Korean (although Koreans have mistaken me for one 🙂 ). I don’t quite remember how this Memorable Dish became a staple in our Chinese/Macedonian household. Maybe it’s because my mom had this Korean food craze where we had Korean meals for Sunday dinners. (She took some Korean cooking lessons at our local Korean grocery store. They were taught in Cantonese to lure Chinese home cooks into experimenting with cooking Korean foods.) Or maybe all the kids love this dish and we just kept on making it because it’s so easy. Either way, the whole family adores this Memorable Dish. 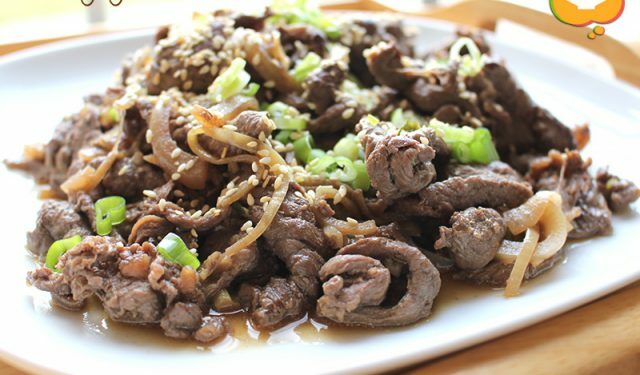 You can buy frozen thinly sliced ribeye beef at your local Chinese or Korean grocery store. People usually use this thinly sliced beef for hot pot. If not, you can buy a big piece of ribeye beef and thinly slice it yourself. The tip is to freeze the piece of beef in the freezer until it’s a bit hard and you can slice it easier with a sharp knife. 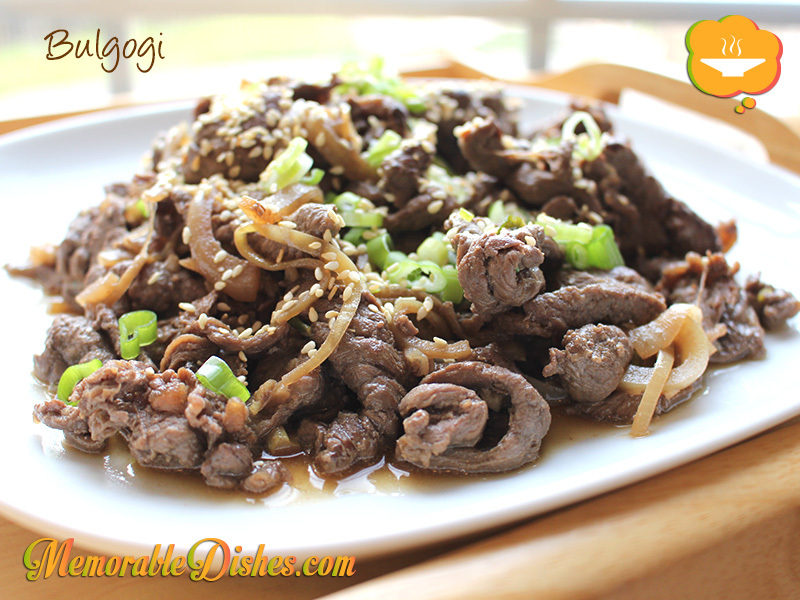 Try this easy bulgogi recipe and make this a Memorable Dish for your family 🙂 . Marinate beef with all the marinating ingredients for at least 30 minutes. Heat oil in a wok or a large frying pan. Sauté the onions until they are translucent (about 5 minutes). Add beef to the wok and stir-fry until it’s cooked. Garnish with sliced green onions. If you go apple-picking like our family does every Fall, you probably end up with a huge bag of apples that costs more than it would buying from the store. But our kids love it so we do it. (Ok, maybe I like it too 🙂 .) If you’re sick of eating those apples day after day, this recipe is perfect for you. 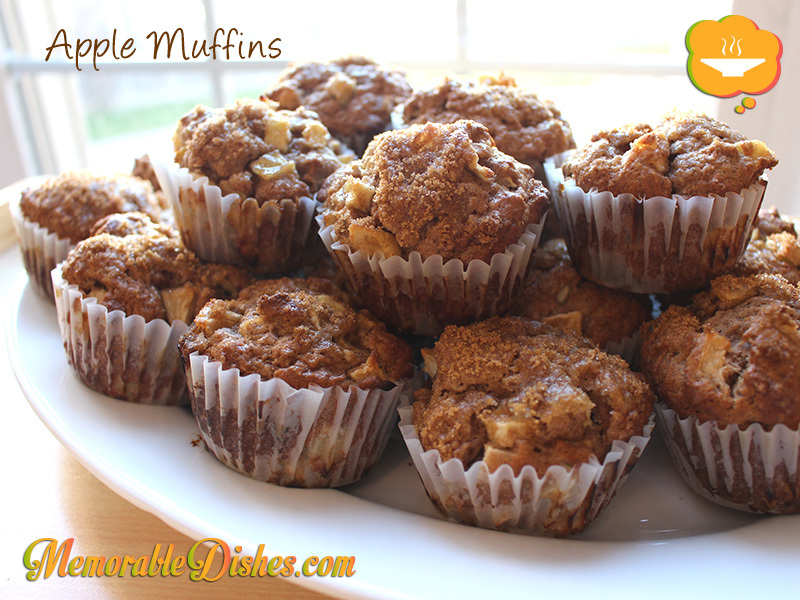 I’ve been using this recipe to make apple muffins when we have lots of leftover apples from apple picking. Surprisingly, this year I hardly had any apples left! We ate some and gave some away. But it seemed as if our pile of apples dwindled faster than I could make my muffins! (I usually make at least 2 batches.) I think the kids are growing and consuming more 😛 . Of course you can bake these apple muffins anytime you want and not just wait for a surplus. As usual, I used less sugar than the original recipe called for because I find most baked goods recipes too sweet. With the brown sugar sprinkled on top, it’s the perfect sweetness combined with a bit of tartness from the apples. This Memorable Dish is so great for breakfast or a snack. Line muffin pan with baking cups. Mix together the flours, baking powder, baking soda, salt, and cinnamon, and set aside. In a separate bowl, cream the butter and coconut oil. Add the granulated sugar and 1/4 cup of the brown sugar. Beat until fluffy. Add the egg and mix well; stop once to scrape the sides and bottom of the bowl. Stir in the dry ingredients and fold in the apple chunks. Divide the batter evenly among the prepared muffin cups, sprinkling the remaining 1/4 cup brown sugar on top. Bake for 10 minutes, turn the heat down to 400°F, and bake for an additional 10 minutes, or until a toothpick inserted into the center of a muffin comes out clean. Cool the muffins for 5 minutes in the tin, then turn them out onto a wire rack to cool completely. Modified from original recipe at Smitten Kitchen. Here you can learn more about apple health benefits from Health Ambition and Well Being Secrets. Hearing the clanging sounds of Chinese scissors and smelling rice roll being steamed bring back childhood memories of eating this Memorable Dish on the side of the road. The street vendor lines a brown parchment-like paper on top of a metal dish and cuts each strip of rice roll perfectly for each mouthful. Then he drizzles hot oil and gives us the option of adding the amount of soy sauce we want. 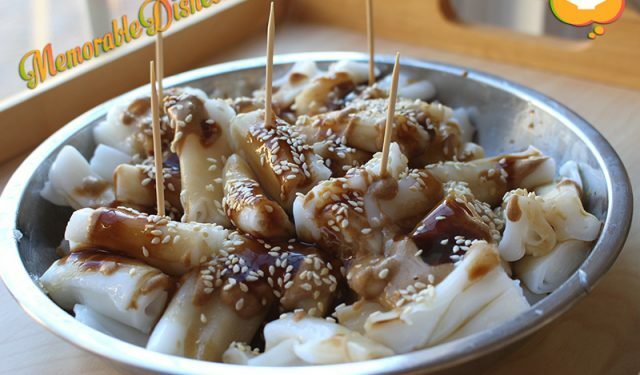 The sesame sauce and hoisin sauce are diluted perfectly so it allows easy drizzling over the top of the steamed rice roll. There’s hot sauce available as well. I love hot sauce normally but I usually don’t put any in my steamed rice roll. I think the hot sauce overpowers the yummy combination of the oil, soy sauce, hoisin and sesame sauce. Growing up in the mid-80s Hong Kong, food hawker carts were still on the streets at that time. Now, all the street vendors have moved into mini-mall food courts or they actually have a store alongside on the street. Eating breakfast on the street was a regular thing to do. I remember some schools didn’t allow kids wearing school uniforms eating on the street because they didn’t want a bad reputation for their school. But we didn’t care, we ate on the streets anyways. It wasn’t like there was uniform police who arrested us 😛 . Even with my non-pork fat oil version, I almost devoured the whole package of steamed rice rolls myself! I think it’s the texture of the rice roll mixed with the combination of sauces that heightens my sense of the umami taste. My kiddies love eating this steamed rice roll as well. It’s too bad that they won’t be able to experience eating this Memorable Dish like I did because food carts like this are no longer on the streets. Their memory of eating this would be being served at restaurants or at home. Make the sauce by diluting 1 tablespoon of Chinese sesame paste with 2 tablespoon of hot water and 2 tablespoon of hoisin sauce with 1 tablespoon of hot water. Set aside. In a small pot, heat 1/4 cup premium soy sauce, 1/4 cup water and 2 tablespoon of sugar until the sugar dissolves. Set aside. 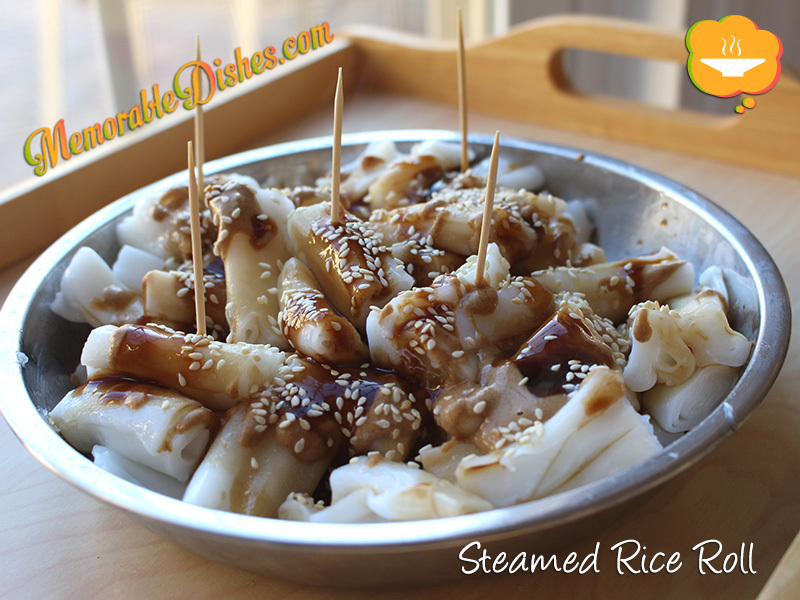 Cut the fresh rice roll into 1 inch pieces and place them on a metal or ceramic plate. To steam the rice rolls, put approximately 1-2 inches of water in a large pot and bring it to a boil. Once the water is boiled, place bamboo steamer on top and place plate inside steamer and cover. Steam until rice roll is heated through (5 minutes or longer depending on how fresh rice roll is or if it’s in the fridge). Drizzle heated oil, toasted sesame seeds and enough sauce and soy sauce to taste. You can make your own toasted sesame seeds by placing raw seeds in a shallow pan and heating them gently on top of the stove. Mix and watch carefully because once it starts toasting, they can heat up pretty fast. In that garden box, I got a few cucumbers, a few tomatoes, a fair amount of cherry tomatoes but the peppers never grew. However, the fuzzy squashes just keep on giving. My husband recently picked two ginormous squashes because I could never find them hidden underneath the big leaves. He even said there’s another small one growing right now (thanks to our mild weather this fall). This Memorable Dish is one of my favourite childhood dishes. I remember my mom making it quite a bit. This dish is great for the kiddies because it’s brothy, noodle-ly and made with meatballs. What kid doesn’t love meatballs! Although they’re not too crazy about the squash part of the stew, they hesitantly eat it due to my daily propaganda of the importance of eating vegetables. 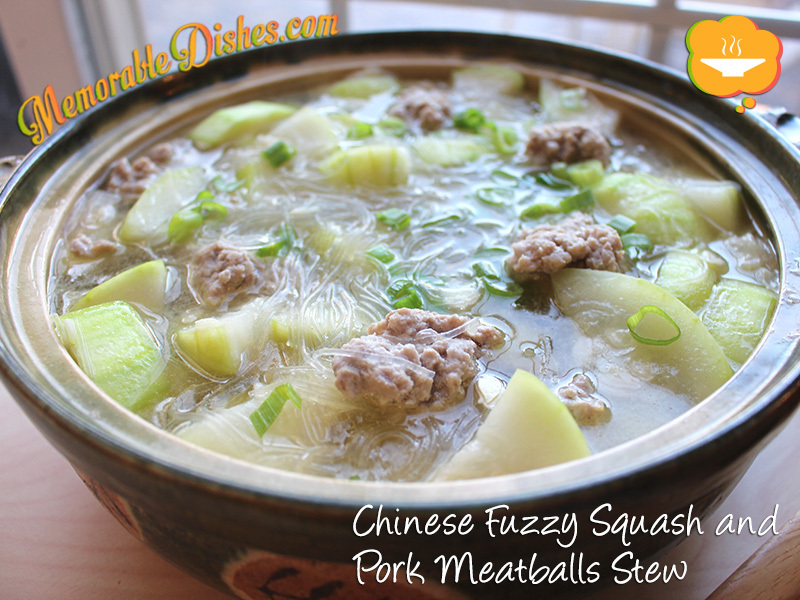 This Chinese fuzzy squash and pork meatballs stew definitely brings me back warm, fuzzy and cozy memories 🙂 . Marinate pork with soy sauce, salt, sugar, cornstarch, white pepper, sesame oil for at least 30 minutes. Reconstitute the dry cellophane noodles by soaking them in cold water. Shape pork into golfball sized meatballs or smaller and set aside. Heat 1 tbsp of oil in a large pot. Once the pot is heated, put 2 slices of ginger and stir fry along with the fuzzy squash for a bit until you get a bit of colour. Add the chicken broth and once it’s brought to a boil, slowly add the pork meatballs one by one. Cover and lower heat once the broth boils again. Cook for approximately 10 minutes until fuzzy squash is tender. Bring heat back up again and put cellophane noodles in the broth. Once it’s boiled again, turn heat off and garnish with green onions. I cook my stew in a Chinese ceramic pot that is great for moving from stove to table 🙂 . I don’t exactly remember the first time I had Shepherd’s Pie. 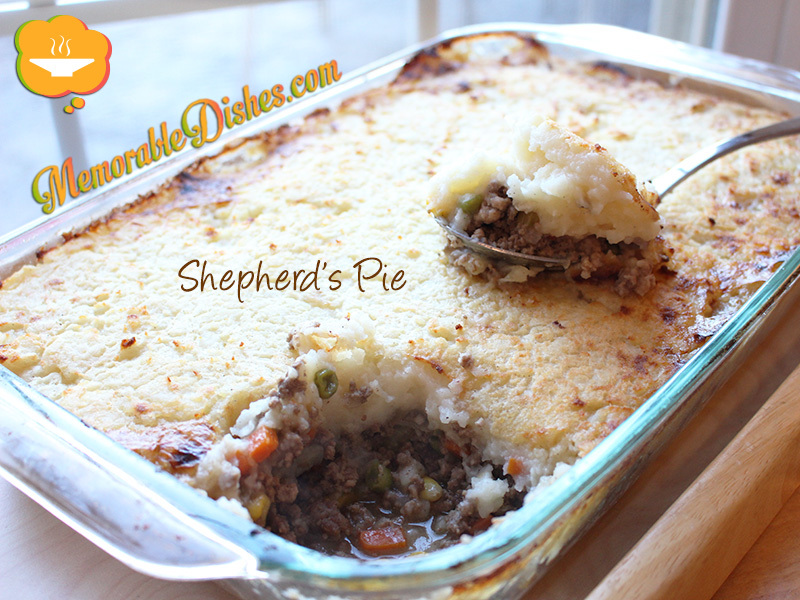 Growing up in an Asian household, Shepherd’s Pie was definitely not a staple. But my adventurous food-loving mother made this Memorable Dish for us at home and we’ve been loving it ever since. Shepherd’s pie is supposed to be made with ground lamb and cottage pie is supposed to be made with ground beef. 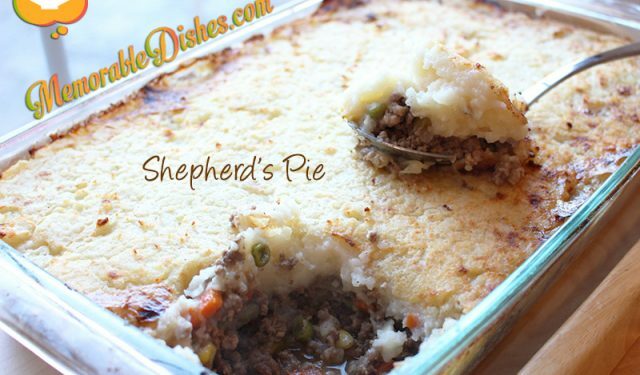 But in North America, we use the term shepherd’s pie synonymously with cottage pie. This recipe isn’t my mom’s original recipe (she probably got hers from a friend or magazine). I remember one of my friends who was studying to be a chef was making shepherd’s pie while I was at his house. He used cumin and nutmeg and I really liked the taste. This Memorable Dish is definitely an all-time favourite dish in our household. Everyone loves it. It can be a bit time-consuming to make. To break up the process a bit, I make the mashed potatoes a day before so I don’t spend all day making it 😉 . Place potatoes and whole garlic clove in a large pot of salted water. Bring to a boil and cook for about 15 minutes, or until tender. Drain, return to the pot and set aside. Brown ground beef in a large frying pan with 1 tbsp of olive oil. Once the meat is brown, scoop it onto a large plate lined with paper towels to drain excess fat. Add the chopped garlic, carrot and celery. Reduce the heat to medium and sauté for 5 minutes. Return the cooked beef to the vegetable mixture, add the spices (cumin, nutmeg, onion and garlic powder) and 1 tsp of salt. Add the beef stock, mix and break down the meat with a wooden spoon as much as you can. Cook for approximately 10 minutes. Add 1 tbsp of flour and stir until thickened. Stir in the corn and peas and turn off heat. Place the pot of drained potatoes over low heat. Add the warm milk and butter. Mash potatoes with a potato masher or hand-held mixer. Spoon the meat and vegetable mixture into a 13 x 9-inch large baking dish. Spread the potato mixture on top in an even layer. Bake for 20 minutes, or until the top is golden brown. If the pie starts bubbling but the top hasn’t browned yet, you can put it under the broiler to be browned for a few minutes. I'm a busy mom of three who loves to cook! I created Memorable Dishes to document Memorable Dishes from Past to Present plus everything about food and in between.